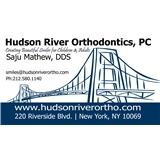 Hudson River Orthodontics, PC (New York) - Book Appointment Online! Hudson River Orthodontics is a boutique style office located on the Upper West Side of Manhattan. Your experience will be unique from start to finish because Dr. Mathew takes pride in performing all patient care himself. Your first appointment, the consultation, is an information session where Dr. Mathew will explain how your orthodontic concerns will be addressed with conventional braces (metal or ceramic), Invisalign, lingual braces, or surgical orthodontics. Dr. Mathew believes everyone should have a great smile because a happy healthy smile leads to happy healthy living. This was such a thorough and wonderful visit the staff made me and my child feel comfortable we look forward to our next visit.